HFAC hosts "A Charlie Brown Christmas" Dec. 7 - Hamilton School District. 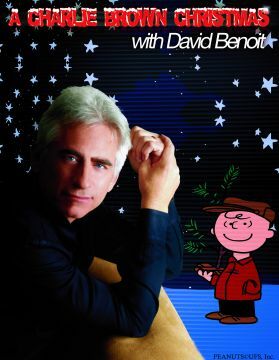 In a very special event for the 2011 holiday season, five-time Grammy-nominated musician, composer, arranger and pianist David Benoit and his quartet will play a show of holiday favorites and Vince Guaraldi-penned Peanuts classics. Songs will include the instantly recognizable “Linus and Lucy” made famous by the Christmas TV specials. The show, which takes place on Dec. 7 at 7 p.m. at the Hamilton Fine Arts Center in Sussex, also features the voices of the Templeton Middle School choir, directed by Jaye Mier. Benoit electrified the jazz world when he released a version of “The Peanuts Theme” that became a No. 1 hit on jazz radio. He has performed “The Peanuts Piano Concerto” with several orchestras as part of his tribute to Charles Schulz and the music of Vince Guaraldi. In 2000, he released his GRP tribute recording “Here’s To You, Charlie Brown: 50 Great Years.” In 2005, Benoit released “40 Years: A Charlie Brown Christmas,” featuring Toni Braxton, Norman Brown, Chaka Khan, Dave Koz, the Rippingtons, Vanessa Williams and others. Experience the magic of a beloved and timeless holiday classic, performed by an artist who through his passion keeps the music of Vince Guaraldi alive and ever evolving. Reserved seating tickets are $25 for adults, $20 for seniors (55 years and older) and $10 for students (17 years and younger). The event is supported by the Hamilton Education Foundation and the Milwaukee Marriott West. UW-Madison Varsity Band Show – March 3, 2012 at 2 p.m. The golden voice of the Crooning King has captured the ear of millions of fans spanning across the generations for more than 50 years. Join the Menomonee Falls Symphony Orchestra in sentimental nostalgic Americana this great performer inspires. His music has been and will forever be a part of the Christmas spirit. General seating tickets are $15 for adults, $12 for seniors (55 years and older) and $6 for students (17 years and younger). One of England’s most revered composers, Ralph Vaughn Williams’epic, powerful Symphony No.5 in D Major will lead us through the story of Pilgrim’s Progress. Also featuring MFSO Young Artist Competition 2011 winners, pianist Elorine Klochow and violinist Shannon O’Leary. Join us for the moving, lush and powerful sounds of Vaughn Williams. General seating tickets are $15 for adults, $12 for seniors (55 years and older) and $6 for students (17 years and younger).